Graduate students and professors worldwide working in all subdisciplines of economics and finance. Secondary audience includes researchers working in macroeconomics and related areas, such as housing, growth, development economics, economic behavior, transportation, and modeling. Holder of the Noranda Chair in Economics and International Trade, Gilles Duranton has taught at the Paris School of Economics, Princeton University, the Universidad del Norte in Colombia, the University of Lille, and others. A consultant for the CD Howe Institute, the World Bank, and the OECD, he is President of the North American Regional Science Council and has won the Philip Leverhulme Prize, the European Investment Bank Prize, and numerous grants and fellowships. he is the co-editor of the Journal of Urban Economics. Fellow, Centre for Economic Policy Research, Fellow, Spatial Economics Research Centre, Fellow, Rimini Centre for Economic Analysis, Member of the Urban Economics Association, Faculty Fellow, Penn Institute for Urban Research. J. Vernon Henderson is one of the world's leading urban economists. Chair of the Urban Studies Program at Brown University, he has taught at the London School of Economics, Delhi University, Tribhuvan University in Nepal, and Queen's University, Canada. Awarded a Guggenheim Foundation grant and elected a Fellow of the Regional Science Association International, he co-edited the Handbook of Regional and Urban Economics, vol. 4 with J.-F. Thisse. 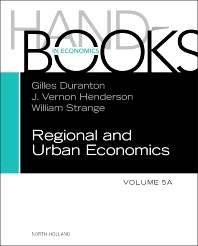 William Strange is co-editor of the Journal of Urban Economics and the President of the American Real Estate and Urban Economics Association. Recipient of the Walter Isard Award for Distinguished Scholarly Achievements in Regional Science, he has published on a variety of subjects.